DraftKings has done a solid job pricing most players this week. Having said that, there are still some great value plays from the lower-tier players. Once again, we use Vegas odds to determine which guys are the best guys. Then, we can examine potential upside for GPP purposes. This week I’ve gone with three stars and three low-salary guys. Here’s who I like. Matt Kuchar $10,400 – Kuchar is actually a must start. No player on Tour is more consistent than him with his eight Top 10s (including one victory). Make sure he’s on your team in this somewhat weak field. Jim Furyk $10,000 – Historically, when Furyk is hot, he stays hot for a long time. He’s finished second in his last two tournaments (shot 66 and 65 on the Sundays) and in the Top 20 in his last six events. Jordan Spieth $9,900 – The second-most consistent golfer behind Kuchar. Yes, he’s young, and he hasn’t won any of his tournaments that he’s been in contention. Two things to note that counteract that theory for this weekend: 1. This isn’t a Major or a big tournament. 2. He hasn’t played poorly historically on Sunday (you could slightly argue this from the Players Championship). Essentially, there are no holes in Spieth’s game, and while people like to use the Masters and Players as reasons to not choose him, he played nearly as well as anyone at Augusta and had a slightly off day at Sawgrass. He’s fired plenty sub-70 rounds to put him in contention on Sunday. David Hearn $7,400 – Three consecutive cuts made, but more importantly, Hearn has finished in the Top 10 three times in the last three months. At 80-1, he’s significantly underpriced. Tim Wilkinson $6,200 – At 150-1 but only $6,200, he’s a bit underpriced. Wilkinson has made eight of his last nine cuts, including a T7 finish at the AT&T Pro-Am. He also finished T22 last week. Bud Cauley $6,100 – Again at 150-1 and only $6,100. However, Cauley should only be used in GPP formats. 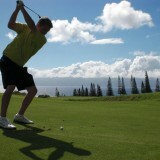 He makes the cut about 50 percent of time, however when he does, he’s thrived, as well as T11. Cauley is the cheapest player at 150-1 and could be a big play if he finishes T20.